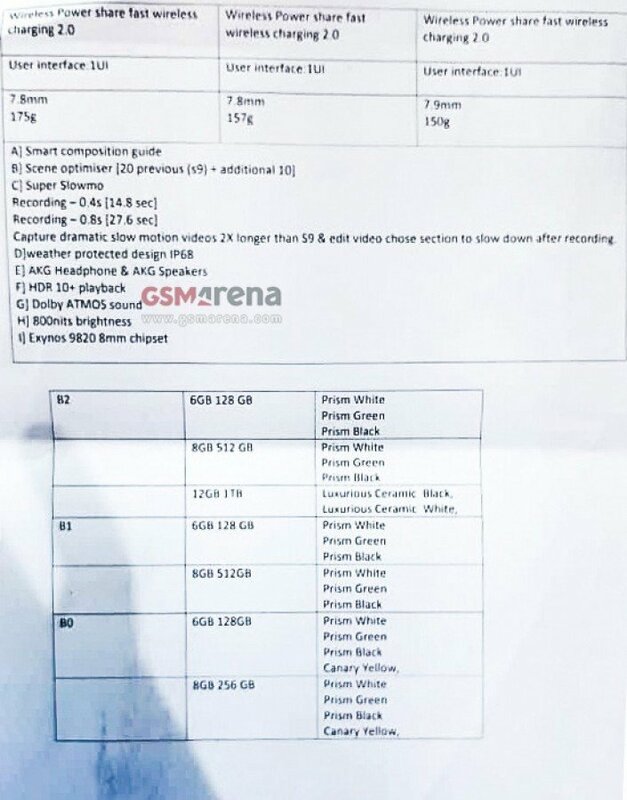 The complete Galaxy S10 technical specifications have been leaked along with that of the Galaxy S10E and the Galaxy S10 Plus in tow. Here’s what the three phones will boast. The Galaxy S10e flat screen variant will sport a 5.8-inch Infinity-O AMOLED HDR+ display which supports a FHD+ resolution of 2280 x 1080 pixels, with an 19:9 aspect ratio, and is protected by Corning Gorilla Glass 5. The S10 and S10 Plus are equipped with curved 6.1-inch and 6.3-inch Infinity-O AMOLED HDR+, QHD+ displays with a resolution of 3040 x 1440 pixels and Corning Gorilla Glass 6. The Galaxy S10 technical specifications reveal that the phone will be available in 6GB/8GB RAM variants with 128GB/256GB storage, as will the S10E but with 128GB/512GB storage. The S10 Plus however will have a 12GB RAM variant, and up to 1TB of storage. Battery wise, the Galaxy S10 features a 3,100 mAh cell, the S10E a 3,400 mAh battery and the S10 Plus has a 4,100 mAh battery. Samsung will tout the Galaxy S10 as the first phone to have a 4K UHD selfie camera, thanks to the 10MP lens that has an f/1.9 aperture, and supports Dual Pixel Autofocus. The S10 Plus has an extra in-display camera which is an 8MP lens that has an f/2.2 aperture, and supports Live Focus. In the main optics department, the Galaxy S10 and the S10 sport Dual cameras with a 12MP f/1.5 dual aperture (77° wide angle lens) that supports Dual Pixel, Optical image stabilization, and a secondary 123° ultra wide 16MP sensor with an f/2.2 aperture. The S10 Plus has an extra camera on the back, a 12MP f/2.4 telephoto zoom lens, which also supports OIS. The S10E and S10 Plus will sport an on-screen fingerprint scanner, while the Galaxy S10 has a side-mounted fingerprint scanner. All three variants run on OneUI based Android 9.0 Pie, will be powered by an Exynos 9820/Snapdragon 855 processor, will have a USB Type-C port, a 3.5mm headphone jack, and support Dolby ATMOS. Samsung has scheduled a Galaxy unpacked event for February 20th, which is a week away. 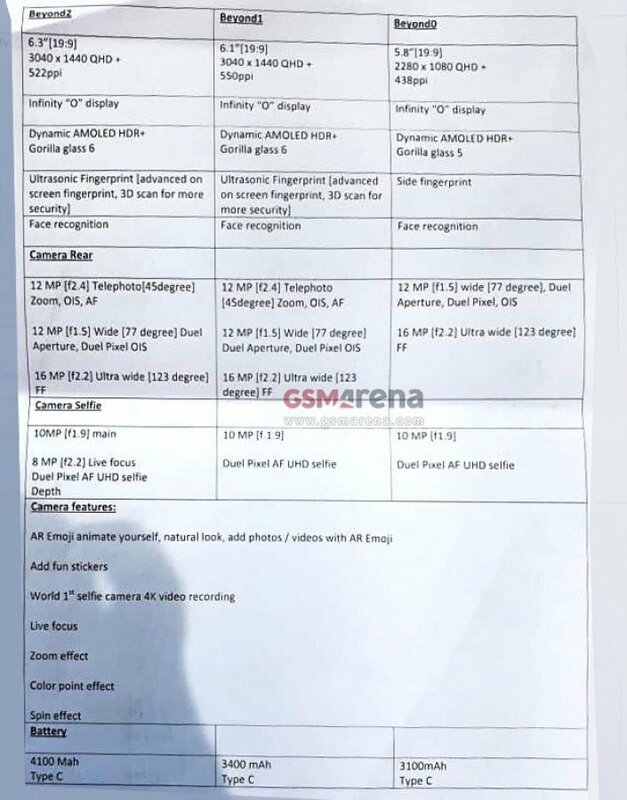 Until the official word is out, take these Galaxy S10 technical specifications with a pinch of salt.